Worthing Thunder are celebrating after securing a spot in another final. A National Trophy semi-final 89-83 victory at Bradford Dragons took them to within a win of another title for the second time in the space of nine months. Led by the influential Zaire Taylor, whose experience of the big time was a factor, firing Thunder through to the showpiece. Thunder pulled away to make the game look safe at the final break. But Bradford’s physical tactics got them back in the match with minutes remaining, although Worthing held on to claim a last four victory. Thunder will take on Loughborough Riders on Sunday, February 10 at University of East London as they bid to be crowned National Trophy champions. The victory at Bradford capped a fine weekend for Worthing. Thunder remain in contention with NBL Division 1 leaders Solent Kestrels after an 81-68 triumph over Leicester Warriors less than 24 hours earlier. Jorge Ebanks weighed in with 30 points and was named MVP. He said: “The more balanced we become the harder it will be to guard us as we have a talented group of guys and on any given night someone can go off, so it will be hard to focus on just one or two players. Thunder have another double-header this weekend as they bid to cement their play-off challenge. 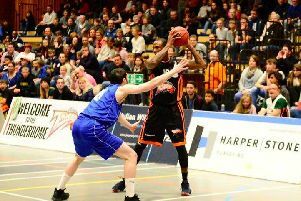 Bradford visit Worthing Leisure Centre on Saturday (7.30pm tip-off) before Hemel Storm are the visitors the following day (3pm tip-off). And Ebanks is relishing the challenge ahead. “I’m excited to have two games because there’s no better feeling than playing in front of our home fans as - they are amazing," Ebanks said.